There are plenty of sources that tout the benefits of one type of golf bag over another, but what if you could combine the best of both worlds? By using one of the best hybrid stand/cart bags, you’ll be able to reap the benefits of both bag types without having to buy each separately. Below are three hybrid golf bags that you can get your hands on, each with their own advantages and useful features. The Taylor Made Flextech Stand Bag gives you plenty of options when it comes to storage and convenience while out on the green or at the driving range. If you’re looking for a bag that offers a professional appearance but is still easy for beginners and intermediate golfers to use, this is one of the best designs. Five-way organization: At the very top of the bag, you’ll have access to a five-way organizational area which is designed to keep most of your clubs separate from one another. You’ll easily be able to slip in five (or more) clubs to prevent them from knocking against one another and deteriorating the grip or the club head. 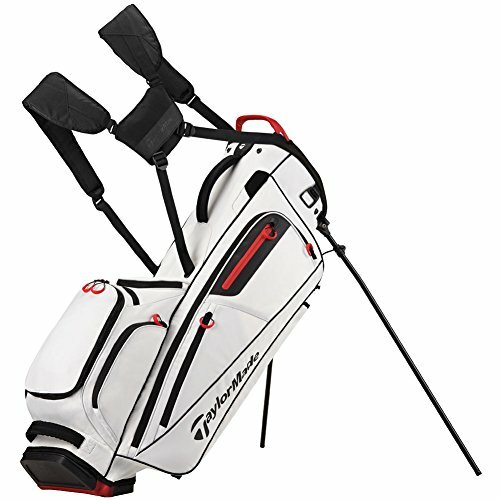 Full-length dividers: Aside from the top organizer, on the inside of the bag, you also have access to full-length dividers that offer additional protection to the bottom halves of your clubs. The full-length dividers also help to make sure that the clubs don’t get tangled while being transported. Weather protected: Instead of finding a way to get off of the green as quickly as possible to protect the valuables that you have stored in your golf bag, each pocket on the Taylor Made Flextech Stand Bag is resistant against weather. Multiple storage compartments: The Taylor Made Flextech Stand Bag offers 11 different pockets, including a micro-suede-lined valuable's pocket for your smartphone. Easily convertible: No matter if you want to use your new golf bag as a stand or a cart bag, it’s easily convertible. The stand system is easily released and collapsible, plus there is also EVA-molded hip pads to make the bag ergonomic and more comfortable to carry. Scratch-resistant material: To help protect the overall appearance of your bag, the material used to construct this golf bag is entirely scratch-resistant, which means you won’t have to worry about it being carted around in a golf cart or thrown in your trunk. As another one of the best hybrid stand or cart bags on the market, the Callaway Golf Capital Stand Bag also offers plenty of features comparable to the Taylor Made Golf Bag. With that being said, it works as the perfect replacement for an existing golf bag or even if you’re buying your very first bag to keep your gear organized while you’re playing a round of golf with friends or competitors. Plenty of storage: Five separate pockets are easily accessible on this golf bag including an apparel pocket that is the full length of the bag, a water bottle sleeve, a valuable's pocket, a glove pocket, and a full-size pocket for your golf balls. Five-way divider: With the help of the five-way divider, you’ll easily be able to keep your clubs separated, so they are protected while being transported. 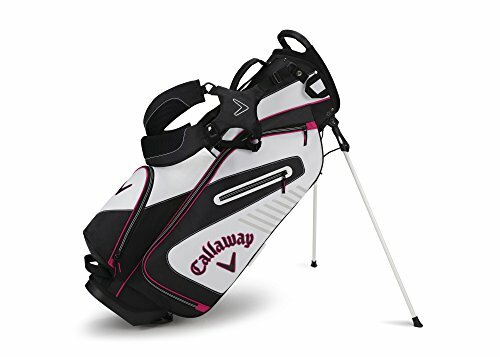 Padded carrying straps: The Callaway Golf Capital Stand Bag is designed with a dual-strap carry system, and each of the straps is comfortably padded to help protect your shoulders from strain and discomfort. Breathable hip pad: It can be tough to carry a large golf bag on a hot day, especially when the bag is against your body. The added mesh hip pad adds to the breathability of the bag, keeping your body cool and dry. 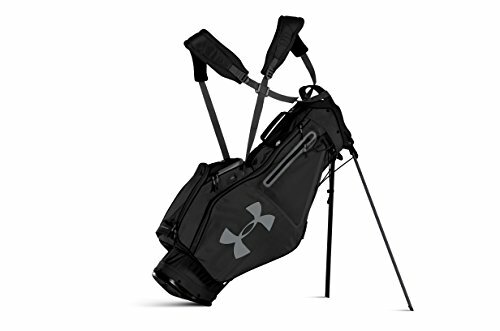 As one of the most well-known brands in sports, the Under Armour Storm Speedround Stand Golf Bag has a unique modernized appeal when compared to other golf bags on the market. There are a lot of extra features that you’re sure to use to your advantage, which is what makes it one of the best hybrid stand or cart bags on the market. Water resistant: There’s no way to predict changing weather conditions, especially if you live in an area where it could rain in an instant. The weather-resistant materials used in the construction of this bag help protect your clubs and everything that you have stored in the pockets. Four-way organizational top: With the use of the four-way organizational top, you’ll be able to keep most of your clubs separated from one another to preserve their integrity. Nine storage pockets: There are nine total pockets on the Under Armour Storm Speedround Stand Golf Bag, two of which are patented UA Storm pockets to help keep your valuables and essential gear dry. Built-in support: With the bag, you’ll be able to benefit from the built-in lumbar support to make your golf gear easier to carry. X-Strap Dual Strap System: As another patented technology included in the Under Armour Storm Speedround Stand Golf Bag, the X-Strap Dual Strap System gives you the ability to release the carrying straps easily. The stand is activated in seconds. The front pocket is not removable. When you’re buying the perfect golf bag, there are plenty of things to take into consideration. You’re undoubtedly going to want to find a high-quality bag from a name brand that offers plenty of features ranging from water resistance to more than enough storage for all your gear. With all that being said, we’d recommend the Taylor Made Flextech Stand Bag as one of the best hybrid stand/cart bags ever designed. Not only does it have a high-quality finish that feels and looks durable, it also stands up against wear over time, especially with the help of its weather-resistant and tear-resistant materials. You’ll also find that it has more than enough storage with its 11 pockets, including the lined valuable's pocket that is also weather resistant to protect your important belongings from water damage. Not to mention that the Taylor Made Flextech Stand Bag is also lightweight and thinner in its design when compared to other golf bags, which makes it incredibly easy to carry, store in a cart, or use as a stand bag.